About a month ago most Oregon fans were probably thinking that Dana Altman and the Oregon Ducks men’s basketball team were experiencing an aberration. Just think about it for a second. How often does a team with little to no experience, lack of roster depth and practically no interior size succeed? Sure, this isn’t the first time a sports team has faced such unparalleled circumstances, and it won’t be the last time, either. But it’s probably safe to say that most Oregon fans didn’t predict these young, high-flying Ducks to have the type of season they’ve had so far. 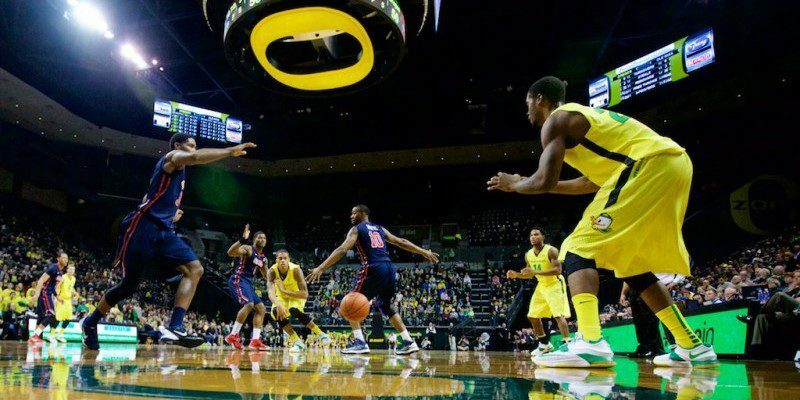 After coming out victorious against the Stanford Cardinal and the California Golden Bears in its last two games, Oregon has officially positioned itself for inclusion in the March Madness circuit. According to TeamRankings.com and its NCAA Bracket Predictions, the Ducks’ probability of playing in the famed tournament has skyrocketed in the last two weeks. Nearly two weeks ago, Oregon was projected to miss the tournament; things look a whole lot better now. The mighty Ducks now have a staggering 91% chance of being one of the 64 teams to play during March Madness. What’s even more impressive, though, is that Oregon is projected to have outside shot of advancing all the way to the sweet sixteen. Wait, did you just read that correctly? You certainly did. Just to be clear, the Ducks aren’t guaranteed anything yet. And the fact that Oregon has made it this far, considering all of its deficiencies, is amazing. The Ducks still have to play one more regular season game in Corvallis against the Oregon State Beavers on Wednesday. Fifteen of the Beavers’ 17 victories have come at home, which means that Oregon State will not make it easy for Altman and the Ducks. However, although they may be young and inexperienced, the men in green and yellow are out to prove that anything is possible. Nobody knows exactly how far this Oregon team will go, but one thing is certain: it’s been a fun ride so far.